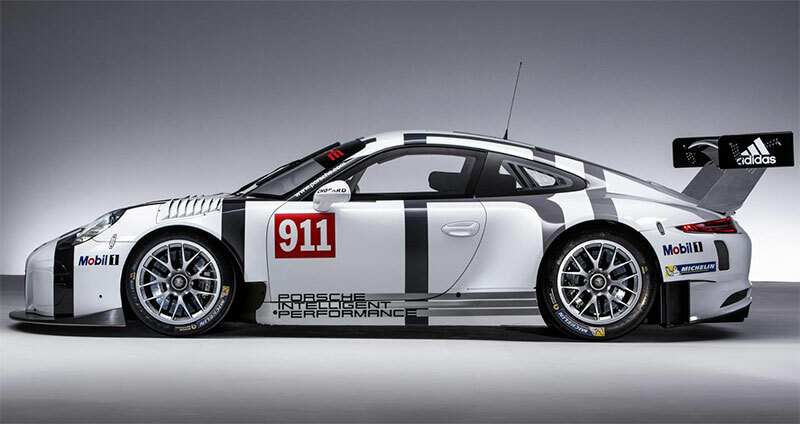 Based on the 911 GT3 RS production sports car, Porsche has designed a customer sport race car for GT3 series around the world: The 911 GT3 R. In devel-oping the more than 368 kW (500 hp) racing nine-eleven, special attention was paid to lightweight design, better aerodynamic efficiency, reducing consumption, improved handling, further optimised safety as well as lowering service and spare parts costs. Adopted from its production sibling, the 911 GT3 R features the distinctive double-bubble roof, and the wheelbase which had been lengthened by 8.3 centimetres com-pared to the previous generation. This ensures a more balanced weight distribution and more predictable handling particularly in fast corners corners in comparison to the previous GT3 R. By applying systematic lightweight solutions for the body, add-on parts, and suspension, the engineers significantly optimised the centre of gravity position of the GT3 R compared to the predecessor model. The lightweight body de-sign of the 911 GT3 RS production sports car featuring intelligent aluminium-steel composite construction has proven to be the ideal basis for the race car. The roof, front cover and fairing, wheel arches, doors, side and tail sections as well as the rear cover are made of particularly light carbon-fibre composite material (CFRP). All win-dows – and for the first time even the windscreen – consist of polycarbonate. Powering the new 911 GT3 R is a cutting-edge four-litre flat-six unit which is largely identical to the high-performance production engine of the road-legal 911 GT3 RS. Direct petrol injection, which operates at pressures up to 200 bar, as well as variable valve timing technology ensure a particularly efficient use of fuel. Moreover, the normally-aspirated engine offers significantly better driveability and a broader usable rev range. Power from the rear engine is transferred to the 310 mm rear wheels via a Porsche sequential six-speed constant-mesh gearbox. As in the GT road-going mod-els of the 911, the driver changes gears via shift paddles conveniently positioned on the steering wheel. 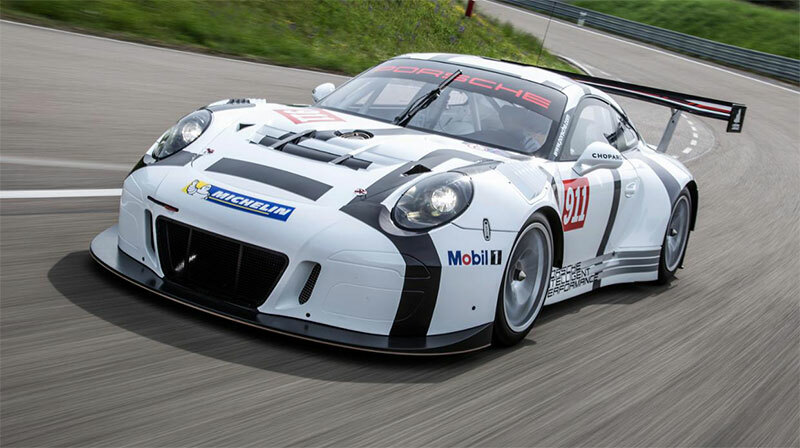 The aerodynamics of the 911 GT3 R also follows the example of the road car. The distinctive wheel arch air vents on the front fairings increase downforce at the front axle. Measuring two metres in width by 40-centimetres in depth, the rear wing lends aerodynamic balance. 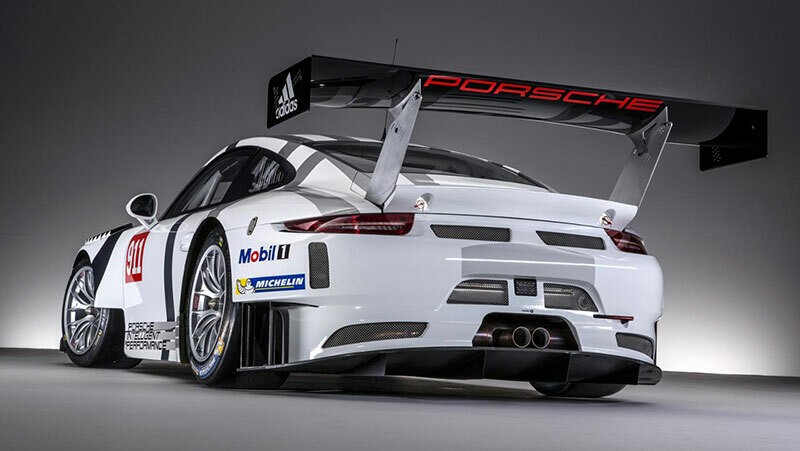 From its 911 RSR big brother, the GT3 R has adopted the concept of the centrally-positioned radiator. By eliminating the side radiators, the po-sition of the centre of gravity was improved, the radiator is better protected against collision damage, and the venting of hot air through louvers in the front cover was enhanced.